The Sports Media Canada Award for Outstanding Sports Broadcasting is presented to a sports journalist in Canada whose fulltime occupation is broadcasting sport and whose work can be seen or heard on a Canadian radio or TV station or radio or TV network in Canada. The 2000 Award is shared by the popular TSN baseball telecast team – Buck Martinez and Dan Shulman. 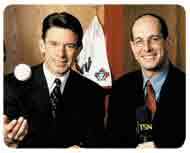 Although both work, from time to time, with different partners on telecasts of other games and sports (in Shulman’s case on NBA and U.S. college basketball), their skills were honed and some of their best work has been on the TSN coverage of the Toronto Blue Jays — certainly work deserving of the 2000 Sports Media Canada Award for Outstanding Sports Broadcasting.